FAST FACTS: Rahal started 19th, moved into the lead and ran mostly in the top five. He pitted from second place on Lap 186/250 but dropped back to 17th after the fueler made a mistake that led to damage to the fuel hose and an extra pit stop. Once the race resumed after a caution for debris, he steadily moved up to fourth place before he resumed the lead from time-to-time. He was in the lead when the race was red flagged with five laps to go and maintained the position through the restart and final lap to earn his first victory since he won in St. Petersburg with Newman/Haas/Lanigan Racing on April 6, 2008 at the age of 19 years and 93 days old… He led a total of 15 laps in his fourth Indy car race here today. In 2014, Rahal qualified 10th and finished 19th. In 2013 he qualified 18th but started 22nd after grid penalties were assessed. He was in 14th place, one lap down to the leaders, when a mechanical failure ended his race and he ultimately finished 15th. He qualified 11th in 2012 with Service Central Chip Ganassi Racing (SCCGR), started 18th after a penalty for an unapproved engine change and finished sixth. He is looking to close the season with a top-five performance… His best finish this season is first place at Auto Club Speedway. His best oval start is sixth at Texas… He is ranked fourth in series point standings with a total of 334. He trails third place Scott Dixon by 24 (358), second place Will Power by 27 (361) and Juan Pablo Montoya by 73 (407) after Round 11 of 16. SECOND WIN FOR RLL AT FONTANA: The 2015 MAVTV 500 marked the 14th IndyCar race for Rahal Letterman Lanigan Racing (RLL) here. The team was entered in seven CART/Champ Car races from 1997-2003 but the 2003 event was cancelled due to wildfires. In total, the team competed in six CART/Champ Car races (all scheduled as 500-mile races; five run as such) and seven Indy Racing League/IndyCar Series events (2002-2005, 2012-2014). The team won TWO RACES (GRAHAM RAHAL 2015, Jimmy Vasser 2002), made TWO front row starts (2nd: Max Papis 1999, Kenny Brack 2003), earned FIVE podiums (2nd – Papis 1999 & 2001; 3rd – Vitor Meira 2005), and led 407 laps (chart available). The team entered cars for Bobby Rahal (1997-1998), Bryan Herta (1997-1999), Max Papis (1999-2001), Kenny Brack (2000-2001, 2003), Jimmy Vasser (2002 – both CCWS & IRL), Michel Jourdain (2002-2003), Buddy Rice (2004-2005), Vitor Meira (2004-2005), Danica Patrick (2005), Takuma Sato (2012), Graham Rahal (2013-2014) and James Jakes (2013). The No. 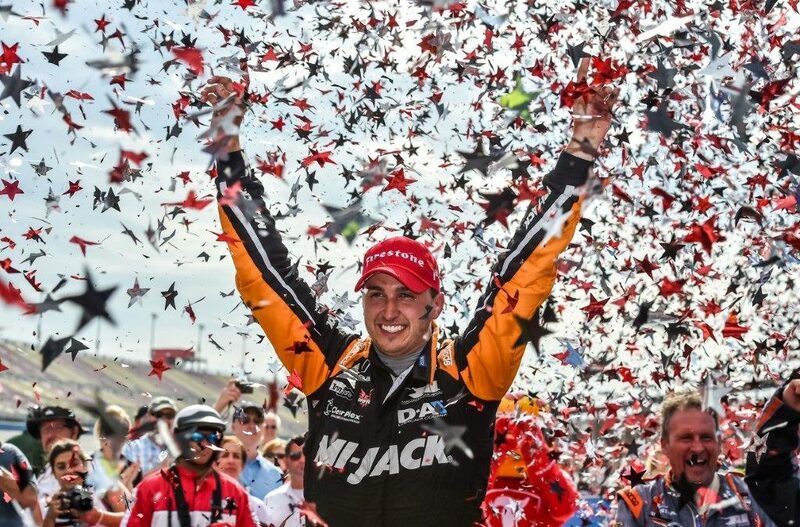 15 Mi-Jack entry for Graham Rahal brought that total to 24 Indy car entries in this race. NEXT UP: The ABC Supply Wisconsin 250 will take place July 11-12.